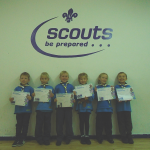 Six new Beavers were invested into Hessle Beavers. During the evening we had been working towards our Disability Awareness Activity Badge, and had learnt our promise in sign language. Whilst the new Beavers said their promise, the rest of the colony signed it. 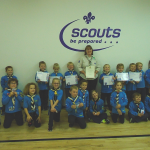 Lots of badges were awarded to everyone, along with a Chief Scout’s 5 Years Service Award for TicTac. Well done everyone!